It's not a massive secret that smartphones are turning into powerful mobile computers that we can carry around and enjoy. Thanks to that, mobile data traffic is going up and up, and yet, some of the figures stated below are simply astonishing. 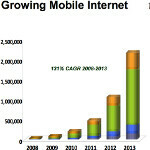 Just one example - according to Cisco, mobile data traffic in 2010 "was three times as large as all the world's combined Internet traffic in 2000", and it's bound to grow - calculations claim that in 2015 we will witness a 26 times increase compared to what we experience at the moment. Moreover, year-on-year growth was 2.6 times between 2009 and 2010. The future data traffic increase is mainly attributed to video calling and sending of video clips. Furthermore, this beautiful word - 4G - will play bigger and bigger role as time passes - at the moment, the average wireless speed on a mobile handset worldwide is 200Kbps, and that speed is expected to become 2.2Mbps with the mass 4G deployment.